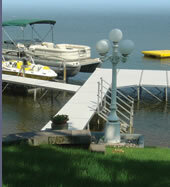 Shoreline Marine Contracting has two crane barges able to service any waterfront or lakeshore problem. Both barges are fully equipped with professional crew and equipment allowing us to address any shoreline project quickly and efficiently. From tree and brush removal to shoreline repair and riprap installation we are ready to work on your shoreline today.